Sleeping bags, bug spray and matches. That’s all you’ll need for your family camping trip, right? We know there’s plenty more that you’ll need to do to plan for your family camping trip. That’s why we’ve provided you with this family camping checklist from glyphguys.com to make sure you don’t forget a single thing on your camping trip. This is a family camping checklist that is intended to help organize with a multi-day car camping trip. The guys at glyphguys.com have used this family camping checklist for years. This camping checklist can be modified for your family’s needs. After you have downloaded the check list for camping, you can add new items to each camping checklist as needed. For example, the camping checklist for equipment includes all of the items you’ll need for two tents. If you’re traveling in a large pack, you might want to add all the items you’ll need for a third tent to the camping checklist. This convenient family camping check list also includes a cooking equipment, food and personal items check list for camping. There’s even an example food check list for camping already provided for you. Download this free, printable family camping checklist here. 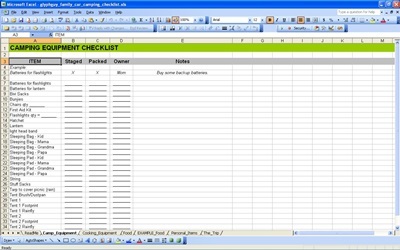 Make sure to check out our other exciting Excel spreadsheets and free Excel templates. Also, be sure to spread the word about this useful family camping checklist to your friends!